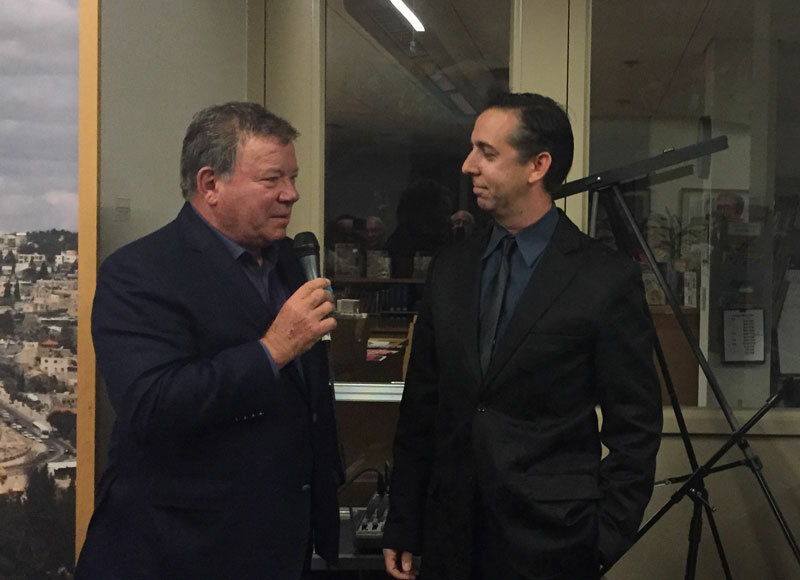 Presenting "To Boldly Go" to William Shatner. I still can't quite believe it. This photo? It's me and William Shatner. With a papercut I made for him. Seriously. 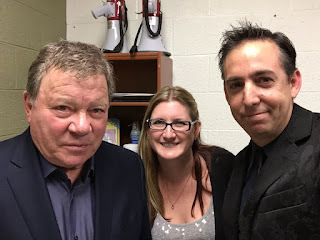 Sorry – but I'm genuinely such a huge fan of Star Trek and William Shatner, and this was a dream for me. I was given the opportunity to create a piece for William Shatner and present it to him on behalf of the Jewish Federation of Greater Portland at their annual gala. 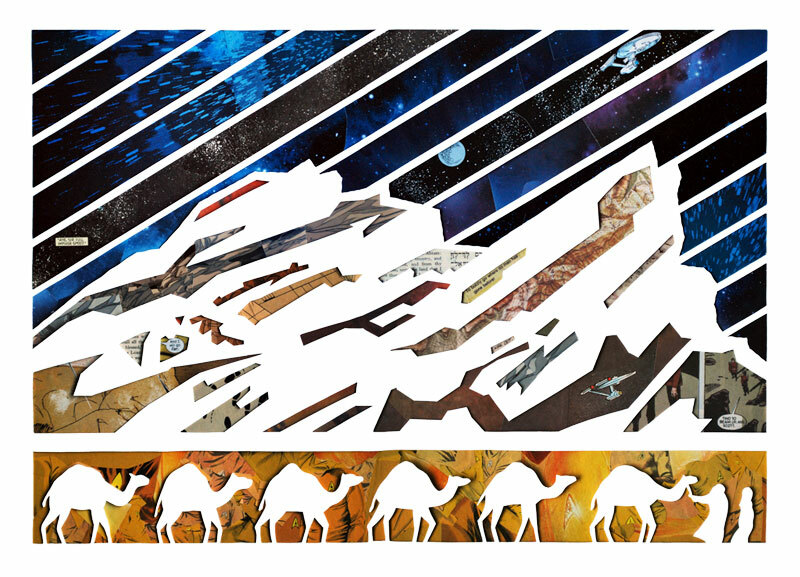 The complete papercut; click to enlarge. You can buy a print here. 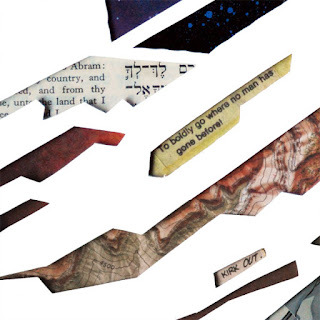 The papercut is a representation of “Lech L’cha,” the Torah portion in which Abraham and Sarah are told by God to leave their home and travel to a new land: Canaan (Genesis/Bereshit 12:1–17:27). 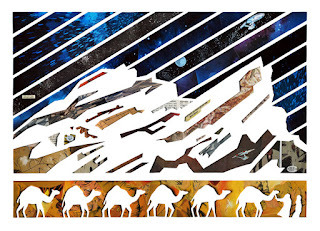 This desert journey is set against the backdrop of Vasquez Rocks, a California location familiar to viewers of Star Trek (and many other television shows and movies), and it’s made of cut-up Star Trek comics with a focus on Captain James Tiberius Kirk. Details of a bit of an old chumash and the opening words from "Star Trek." The papercut contains comic book quotes and speech bubbles related to the message of “Lech L’cha,” it is set against a star-filled background from those comics, and the background behind Abraham and Sarah’s caravan is made of a mosaic of appearances of Captain Kirk’s uniform shirt. And of course, the Federation Starship Enterprise is included as well. 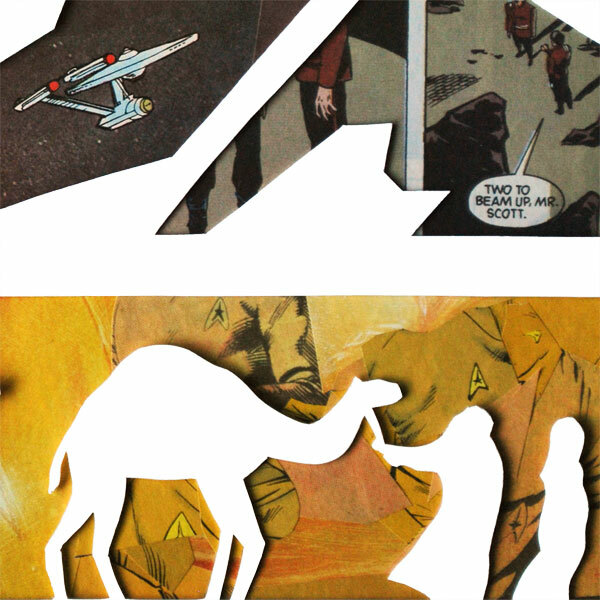 The Federation Starship Enterprise, a travel-related quote, and Abraham and Sarah. This is the chapter in our Torah when people are first cited as a source of blessing to others; we read that Abraham and Sarah are a source of blessing for all those they come in contact with. 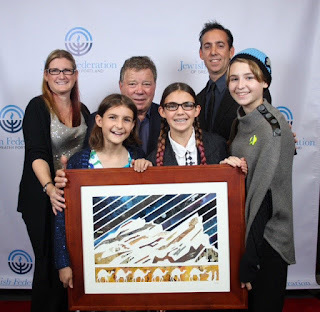 Similarly, William Shatner has used his talent and celebrity to share his blessings with others in various community and philanthropic pursuits. 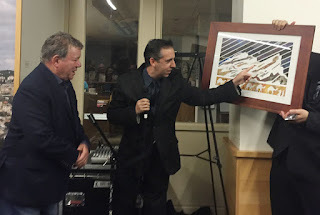 It was such an immense pleasure to present it to him in front of the Portland Jewish Community – to share the meaning behind the piece and to hear him say that he liked it and would be putting it up in his home. He had such kind words to share about my work. We are all freaking out! Except for Mr. Shatner. We also took selfies with him in the green room! Selfie with Mr. Shatner and my wife/muse Shawna. This was an incredible experience – and one I owe to the fine folks at the Jewish Federation of Greater Portland (especially Event Coordinator Allison Specter and President Marc Blattner) and my buddy Barry Greenberg (of Celebrity Connection). 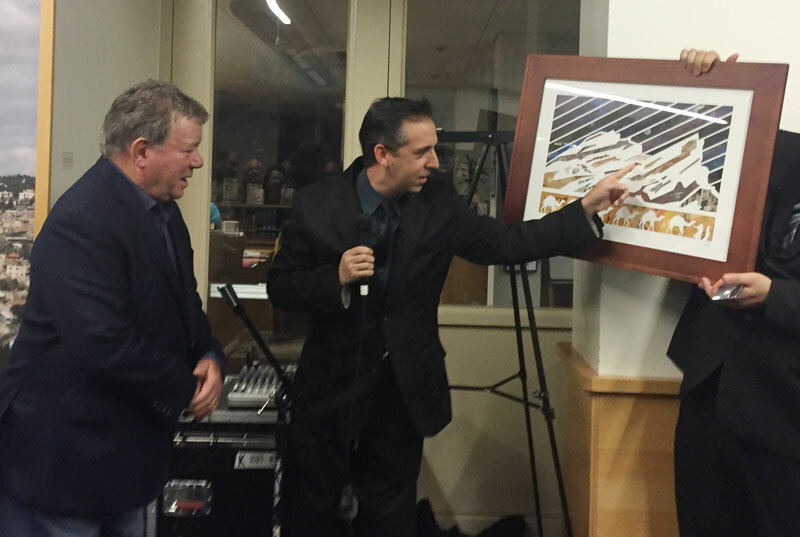 One last thing – the original papercut is going in William Shatner's house, but you can get an archival giclée print of your own, right here. I'll sign it and ship it to you in a fancy tube and everything.